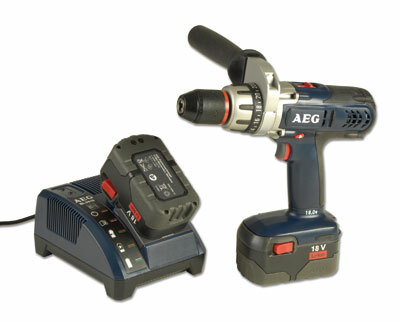 AEG are making an impact with a whole host of power tools available at a shop near you. Now, AEG have been producing excellent quality power tools for the serious amateur and professional user for a long time, but they have been largely confined to specialist outlets so only those in the know would have been aware of them. Well happily, that seems to have all changed. AEG have gone in with a massive product awareness offensive, with hard-hitting and hard to miss adverts, and product displays in good-quality stores. What's this all about then? I asked myself. Curious as ever, I reasoned that if someone is shouting their presence as AEG certainly are, I should be finding out what they are up to and what they are producing. Where better to start, then, than with one of the most important and commonly used tools in recent years for any toolkit, the cordless hammer drill/driver. I obtained the cordless BSB 18STX 18V Heavy Duty Combi Hammer drill to try out with both Li-ion (Lithium ion) and NiCd (nickel cadmium) batteries, both of which should have the power to tackle most of the drilling and screwing projects which one might encounter around the house or the workshop. The torque adjustments are finely tuned and I screwed glass to the wall using the No.2 setting; it stopped and clicked nicely when the screw was fully set, without cracking the glass. On the No.22 setting it had enough oomph to drill a 25mm (1in) hole in wood with no signs of stopping; on the drill setting a 38mm bit was wound into softwood without a hiccup. So power delivery in this 18V drill is not a problem. The handle, which can be rotated into various positions, is a boon when drilling large holes or masonry. Simply alter its position to suit your support and drilling needs, and away you go. Long gone, it seems, are the days of screwing the handle in on the right or left side of the drill and having only two positions. The casing seems rugged and rigid, and survived a couple of inadvertent drops from the bench onto the floor - in one instance the drill landing battery section down; and in the other, it coming down sideways on and bouncing between the front chuck and the rear of the casing. The drill operates off a GBS (Global Battery System), where one battery fits all of that power size. As mentioned above, there are two power options: Li-ion and NiCd batteries. Both versions were tried here. They feature self-cleaning contact and rubber protection on the underside, which also prevents slippage on surfaces. 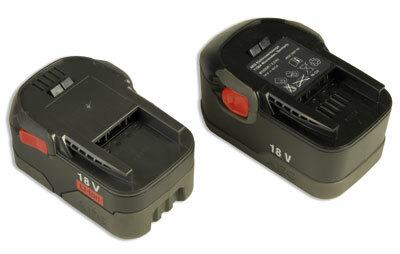 The charger will accept 9.6V, 12V, 14V & 18V batteries. As one would expect, these batteries fit a whole host of AEG products. I liked this drill. AEG have thought carefully about what users really need and want from a drill and have delivered those in spades. The price of this unit is very favourable when compared to others aimed at this market sector. It is going to function for years and the lifetime service agreement provides peace of mind that there is back-up should something go belly up. Whether you opt for NiCd or Li-ion the choice is yours, but you may find our key pointers for each useful. Pro users may opt for the Li-ion while the serious amateur might prefer the NiCd. To help you come to a decision all we can suggest is that you look at how much you are going to use the tool and the cost differential, and weigh up the options for yourself. Whatever option you go for, however, you'll be getting a superb drill that will serve you well. "Whatever option you go for, you will be getting a superb drill that will serve you well"